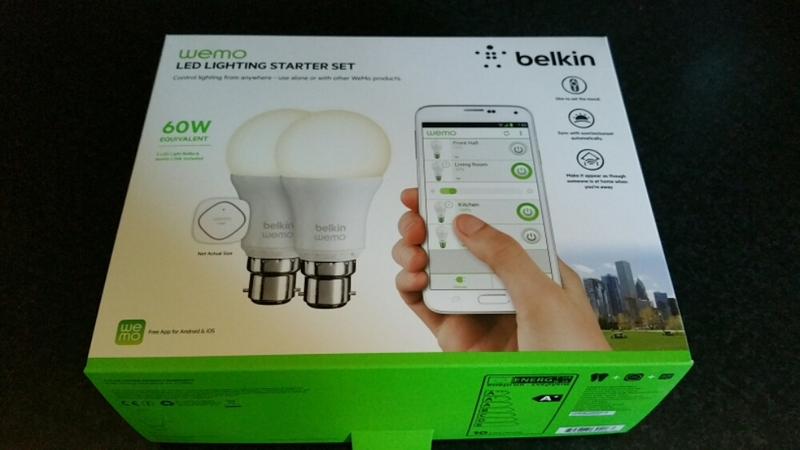 The Belkin WeMo Smart Light Bulb starter kit arrived several days ago. 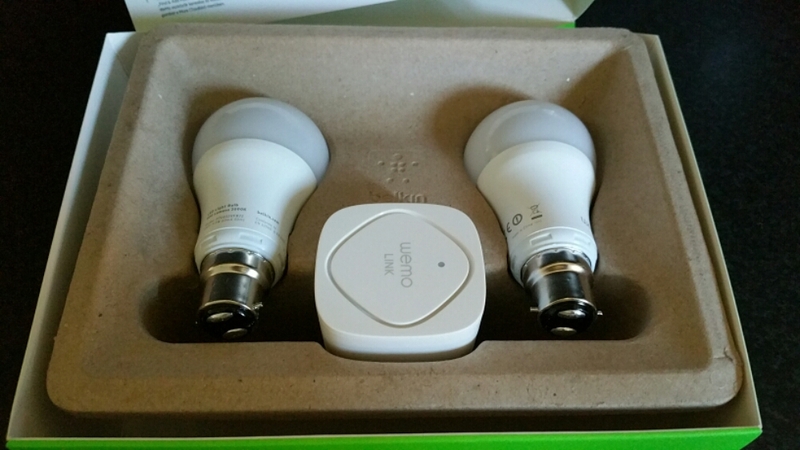 Opening the box reveals 2 light bulbs and a wireless module. See below. 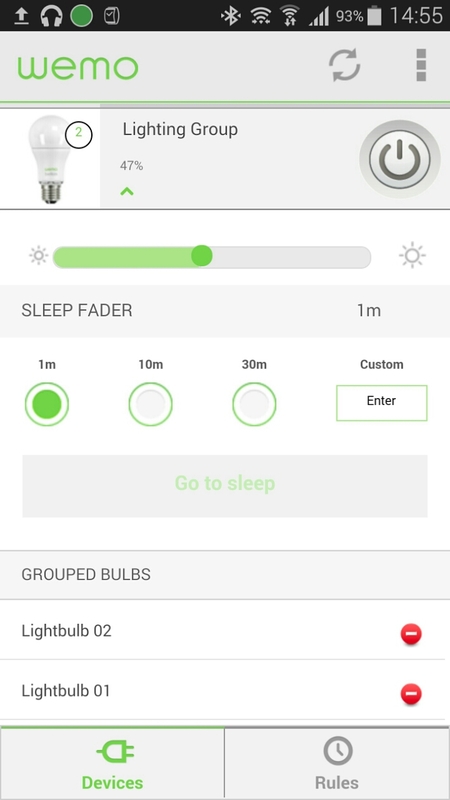 – Connect up to 50 WeMo Smart LED Light Bulbs and control them individually or as a group. – The set works with the entire family of WeMo products. – Turn lights on, off, dim or create custom schedules. Setting up the system is a breeze. First take the WeMo Link and plug it into any electrical socket, preferably centrally situated in your home and where it can get 2 bars wifi strength from your router. Next replace your bulbs with the Belkin bulbs. I bought the Bayonet version but you can also got the screw style bulbs. Turn the light switches on. The Belkin bulbs should turn on. Now keep the bulbs on. Download the WeMo app. Go to your phone’s wifi settings and connect to the Belkin wifi network. A firmware update occurred. This took 5 mins. Next it asks you to select your router and enter its password. The setup completes including remote access over 3g/4G. Once the setup is complete the light bulbs show separately. In the edit device menu I just slid one over the other to join them as a group. They are now controlled together. The basic menu gives you an on / off button. Options include brightness and sleep timers. With the advanced settings you can creates rules as to when the lights come on and off eg sunset and sunrise. The WeMo app also controls my other WeMo products too. In use. I placed the WeMo Link upstairs and used both Belkin bulbs in the lounge. Now, I can’t walk in and just turn the lights on, I now have to open the app, wait a few seconds for it to register and then I have full access and control. Or so I thought. If your lights are off, if you use your normal light switches to turn them on, the Belkin bulbs will turn on at full brightness. If you turn them off with the wall light switches, you won’t be able to use the app to operate them until you turn the power back on from the wall light switch. So for ease. I find it easier to remember to turn them on from the wall light switch, sit down and then adjust the brightness or even use the app to switch them off if convenient. The great part is that you have a choice and don’t lose the convenience. Everything works as advertised but is it worth the £80 and then £25 per bulb? If you like cutting edge, maybe, otherwise it’s expensive. It is worth noting that Belkin sell both bayonet and screw type bulbs fittings whereas Philips Hue light bulbs are screw type only. Another point, once you’ve setup the app on one device, installing the app on another one of your devices, you will find it is already setup for you.